Unless you adhere to the attachment parenting philosophy that espouses a belief in the family bed, you probably don’t want to share your bed with a child every night. Teaching your child to self-soothe and to stay in his own bed can be overwhelming, but it doesn’t have to be a nightmare. There are a few tried and true methods for helping your child to spend the entire night in his bed that can put an end to late-night, pint-sized visitors. The first step to putting an end to your child’s insistence on climbing into your bed each night is to determine why it’s happening. If he’s scared of the dark because you’re turning the hallway light off on your way to bed, it may help to leave the light on overnight. Similarly, a need to use the bathroom can rouse your child from his bed, leaving him unsure of how to put himself back to sleep. Finding the root of his need to spend the night in your bed can help you determine the best course of action to reverse the behavior. Crawling in bed beside your little one for cuddles and a bedtime story is a great way to soothe him into sleep, but it can also make him dependent upon your presence to fall asleep if he awakes in the middle of the night. Breaking the habit of sharing a bit of cuddle time before sleep may not be easy, but it will help him learn how to self-soothe eventually, and also learn that falling asleep without you there to help him is possible. If your child can’t easily leave his room, he can’t make his way to your bed. Using baby gates to keep him corralled won’t present a fire hazard like locking his door from the outside would, as it’s easily scaled in the event of an emergency. Still, it’s an obstacle that will make it more difficult to leave his room in search of yours. If he does still manage to make his way to your bed, lead him back to his bed silently. It’s easier to give in sometimes than it is to keep walking a persistent child back to his room, but giving in sends the message that his persistence will eventually pay off. Making the occasional exception for times when your child is sick or has had a nightmare seems like a no-brainer, but it’s best to only allow these breaks in consistency after you’ve established a good pattern of keeping him in his bed on a regular basis. As with many other milestones in childhood, it’s important to maintain a consistent stance until he learns that spending the night in your bed is only okay when you invite him. You may also find that establishing a policy of allowing your child to visit your bed on certain mornings after an agreed-upon time cuts down on late-night visits. When your child spends a successful night in his own bed, praising him in the morning for the achievement helps him take pride in that accomplishment. The morning after an unsuccessful night, however, you should make sure that you don’t shame him for seeking you out. Make a policy of praising him when he does well, and of not mentioning the times when he struggles. Regardless of what methods you use to keep your child in his own bed at night, it’s important to keep in mind that the change won’t happen instantly. You may have to continue your efforts for a while, but being patient will eventually pay off in the long run. Don’t let a few slip-ups discourage you; your child will begin to naturally assert his own independence after you’ve given him the tools to do so. Before you know it, you’ll be sleeping peacefully in a kid-free bed. The very idea of your child being forced to deal with a scary and strenuous emergency situation is probably downright repellent, but as a parent, one of your most important jobs is making sure that they’re properly equipped to handle anything life throws their way. Even though she may not ever have to put the knowledge to use, simply knowing that your child is prepared to handle an emergency can give you immeasurable peace of mind. For kids, a sense of urgency can accompany a simple problem just as it does a legitimate emergency. Kids need to know how to reach emergency services, how to dial 911 and what to do when she’s speaking to a dispatcher, but also when it’s appropriate to call in the first place. It’s not always easy for little ones to distinguish between problems that require the attention of a parent or trusted adult, and actual emergencies that warrant police, emergency medical or firefighter services. The first step to explaining emergency preparedness to kids is helping them understand what an emergency is and what situations can be handled by a parent or caregiver. 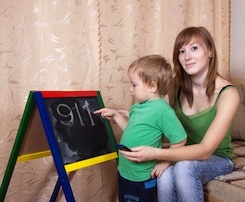 Your child needs to know how to call 911 in an emergency, and what to tell the dispatcher she reaches. Practicing 911 calls can be done safely with a cell phone that’s been stripped of the battery or a landline that’s not plugged in to the wall. When you’re working on this lesson, it’s a wise move to talk about what your child should do if she ever calls 911 accidentally. Hanging up without explaining that the call was inadvertent wastes the time and resources of dispatchers because they’re required to call back to make absolutely certain that there is no emergency. In the event of a real emergency, your child will need to give the dispatcher her full name, her address and be able to explain the nature of the emergency to the best of her abilities. She should also know that the dispatcher will want her to remain on the line until emergency service providers arrive so that she doesn’t immediately hang up after sharing that information. In the event of a fire or a natural disaster, your entire family will need to have a coordinated evacuation plan to ensure that everyone makes it out of the house safely. Explain to your child that all material possessions, even favorite ones, can be replaced and that it’s far more important for them to exit the house than it is to save their belongings. Make sure that she knows how to get out of the house if you’re not able to reach her, to make her way to a pre-arranged family meeting place and what she should do when she arrives there first. You probably won’t need to waste much time on teaching a child that lives in the Midwest how to manage a hurricane, but she will need to know what to do in the event of a tornado. Talking about the natural disasters that are most likely to occur in your area and making a specific plan to deal with them is imperative, especially if you live in a region that’s particularly prone to environmental emergencies. One of the best ways to determine how much your child knows and what she still needs to learn about emergency preparedness is to role play specific scenarios that she could potentially encounter. There’s a reason why public schools practice routine fire drills: they help kids prepare in a relatively low-stress environment for an emergency so that, in a high-pressure situation, they know how to react. Role playing serious injury situations, weather emergencies, a house fire and even potential intruder situations gives you an idea about what your child knows and helps you teach them more detailed information so that they’re prepared to handle any emergency. It’s easy to become so wrapped up in teaching your child the basics of emergency preparedness that you forget how easily frightened little ones really are. While you’re teaching her how to handle a natural disaster or emergency, make sure that you also explain to your child that she’s safe and protected. Let your child know that these things probably won’t happen to her, but that it’s your job to make sure that she knows what to do in a worst-case scenario. Also let her know that there will almost certainly be an adult looking after her and making sure that she stays safe while you’re teaching her how to handle an emergency independently. The iconic image of a father and son fishing trip is one that’s ingrained into the collective cultural consciousness. Even the classic sitcom images of Andy and Opie sharing a heart-to-heart over a fishing creel cements the American idea of fishing as a male-bonding activity. As a father, spending time with your son is an important part of his emotional development, as well as a contributing factor to your filial bond. Here are ten of the reasons why you should take your son fishing, and understand that you’re actually doing something far more important. The Opportunity for Quality Father-Son Time – In the hustle and bustle of everyday life, it’s not easy to set aside a significant amount of time to spend one-on-one with your son. Taking a fishing trip, whether it’s an extensive one that will require an overnight stay or just an afternoon affair, allows you to focus all of your energy and attention on your son. Fostering Conversations You Wouldn’t Have at Home – The quiet stillness of a lake and the relaxing nature of waiting for fish to bite fosters plenty of conversation, some of which would be awkward to broach over the dinner table. The natural evolution of your talks can lead to more than one subject you probably wouldn’t discuss under other circumstances. Passing Along a New Skill Set – In a world where youngsters teach their parents the intricacies of new technology, it can feel like there isn’t much left in terms of skills that fathers pass on to their sons. The age-old art of baiting a hook to catch fish is a real skill, and it’s one that your child can’t fully learn from a YouTube video. 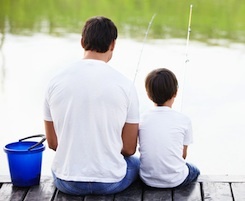 Making Memories You’ll Cherish Forever – As your son gets older and becomes less inclined to spend time with his parents, you’ll have the memories of your shared fishing trips. When he becomes an adult himself, those memories will become fodder for pleasant reminiscence. Encouraging Independence Under a Watchful Eye – You can encourage your son to bait his own hook and cast his own line while you’re there to watch, allowing him to explore some independence as you look on to ensure his safety. Instilling a Love of Outdoor Activity – For outdoorsy fathers, the opportunity to share a love of nature with a son is a valuable one. Instilling a love of the outdoors and an appreciation for fresh air, sunshine and screen-free entertainment is a great way to combat the effects of technologically-advanced, indoor-based living. Temporarily Cutting the Electronic Cord – There are no video games, televisions or computers on the lake, which means that for at least one afternoon your son will be enjoying a completely low-tech good time. What better way to limit your son’s screen time than to take him somewhere that screens aren’t welcome, but fun is still on the menu? Investing in Your Collective Emotional Future – In order to have a strong father-son relationship, you have to forge a strong emotional bond with your son while he’s still young. Fishing together allows the two of you to get to know one another as individuals, to talk openly and enjoy one another’s company. Teaching Environmental Stewardship – When you’re on the lake enjoying an outdoor activity, you’re perfectly positioned to pass along the basic tenets of environmental stewardship without seeming like you’re lecturing or preaching. In fact, you can guide your son in the right direction simply by modeling earth-friendly habits. Establishing a Shared Hobby – A shared hobby allows you and your son a bit of common ground, something that will become even more important as he gets older and looks for ways to assert his independence. The love of fishing that the two of you share during his formative years may be one of the few ways you’re able to effectively communicate during the turbulent times of adolescence. No matter how many lessons and exciting experiences you share with your son on a fishing trip, it’s important to remember that young children have a finite supply of patience with any activity that requires them to be relatively still. You might be thrilled to stay on the lake from dawn till dusk, but your little man will probably only be able to handle one or two hour sessions scattered throughout the day. Remember to take plenty of breaks, and to be patient when your own fishing time is interrupted by an active little boy’s need to explore. Please note that this article was contributed by Kenney Myers and he has a follow up poem titled Fishing Lessons With Dad that you might also find interesting on his personal website. Kenney is an expert in the Child and Senior Care industries with an emphasis on online safety. Family vacations are a great way to make lasting memories that you all cherish for the rest of your lives, but they can also be quite pricey. That doesn’t mean that the trip of your dreams is out of reach, however, even if you’re faced with a relatively tight budget. These 20 savings tips can add up big time, helping you to reach your travel goals before you know it. Start a Family Travel Fund – Pitch in as a family. Contributing allowances, gift money and spare change as a group helps everyone take responsibility for the expenses of an exciting travel adventure. Hold a Garage Sale – The garage sale is a time-honored tradition that can help you create more space in your home as well as collect a bit of pocket money. Holding a garage sale with the intention of putting 100% of the proceeds towards your vacation is a great way to jump-start your vacation savings account. Break Out the Change Jar – Making a habit of dumping your pocket change into a large jar adds up surprisingly fast, even more so when every member of the family is chipping in. Liquidate Your Assets – Selling a bunch of old collectibles that are taking up space online helps you corner a niche market that may not be available through a traditional, on-site garage sale. In some cases specialty items can fetch much higher prices online. Establish a Family Dinner Routine – If your family eats out more than once a week, start researching money-saving meals you can prepare at home and deposit the average check price of those meals into a dedicated savings account. Make Cutting Energy Costs Fun – Make a game of seeing who can use the least amount of energy in your home. Not only will you save big on your utility bills, you’ll also be reducing your household footprint. Sign Up for Flash Sale Groups – Online marketing groups that offer flash sales generally have big-ticket items available at bargain-basement prices for a very short time. Signing up for these groups can help you save big and you can put the money you would have spent away for your family trip. Have Family Coupon Clipping Parties – Clipping coupons is tedious work, but it can be fun when the whole family sits down together to make an event of the chore. Encourage Kids to Contribute – Whether they’re mowing lawns, babysitting, setting up a lemonade stand or chipping in from a birthday fund, encouraging your kids to contribute allows them to make a difference in your vacation budget. This gives them a sense of pride and the savings account a boost. Break Bad Habits Together – If one member of the family is a smoker, another has an expensive coffee habit and the kids are all addicted to sugar, making a family effort to break those bad habits while putting the money saved in a travel account can be a great motivator on all fronts. Cut Down on Car Use – There are times in most families’ lives when it would be just as easy to walk, use mass transit or bike to a location than to drive. When those opportunities arise, take advantage of them and save money on gasoline in the process. Hold a Savings Competition – Competing with one another to see who can save the most is a great way to encourage savings, especially when you’re all contributing to a common goal. Make a Savings Thermometer – There’s a reason why the savings thermometer is a fundraising standby: it works! 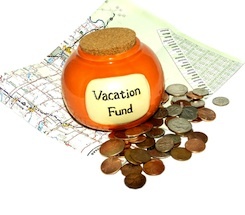 Making your own vacation savings gauge provides an actual goal and shows how much further you have to go before you reach it. Start a “No Waste” Challenge – The average family throws away a shocking amount of money through sheer product waste. Starting a “no waste” challenge encourages more responsible habits and saves money. Take Advantage of Local “Free Days” – Museums, libraries and other institutions often run “free day” promotions. Taking advantage of them allows your family to enjoy no-cost entertainment, freeing up more funds for travel. Host Potluck Get-Togethers – There’s no need to stop entertaining when you’re trying to save, but instead of footing the bill for the entire meal just hold an old-fashioned potluck! When everyone contributes to the party, you’re able to save big and still enjoy the company of your nearest and dearest. Hold Fashion Swaps – Kids outgrow clothing so quickly that it’s not uncommon to send an item with tags still attached to the local thrift store. Hosting a fashion-swap at your house with other parents allows everyone to trade out gently-worn clothing, saving money and enjoying one another’s company in the process. Go Paperless – Stop spending money on stamps, envelopes and checks by going paperless with all of your bills. Get DIY Savvy – There are so many things you can do at home for a fraction of the price of purchasing store-bought goods, all you need is a bit of know-how. Online tutorials for everything from making butter to building furniture are plentiful. Visit Professionals in Training – Rather than spending a small fortune on haircuts, teeth cleanings and other basic services, consider visiting your local training center. There, professionals in training will perform these services with the supervision of a skilled instructor at a fraction of the cost! When is a Nanny Too Sick to Come to Work? Springing for private, in-home childcare usually means that the particulars of your schedule will be met with far more specialized attention than is available through traditional, center-based care. Still, even the best and most accomplished nannies are only human, and they will get sick from time to time. While a little headache or muscle fatigue is no reason to call out of work, there may be times when it’s in everyone’s best interests for your nanny to stay home until she’s well. Investing a sick day of your own into staying home with your children or even scrambling for last-minute back-up care may seem like a major burden, but it is a more favorable solution than allowing a sick, possibly contagious nanny to be left in charge of the most vulnerable members of your family. These are a few of the signs that your nanny is too sick to come to work, and that you might want to start figuring out a temporary alternative plan. When your nanny has a fever, is coughing or sneezing uncontrollably and refuses to be separated from her box of tissues, it’s a good time to start looking for a back-up childcare plan until her symptoms abate. In the end, the one day of work that you’re able to avoid missing may cost the entire family in terms of health. Despite her efforts to wash her hands religiously, sterilize every surface she touches and avoid direct contact with your kids, she could still pass along a nasty cold or flu that makes the rounds through your family. The amount of time you and your partner could miss from work while you’re nursing your own illness may not seem like such a smart trade when held up against the loss of a single day to allow Nanny a bit of sick time. Even if vomiting and diarrhea are not symptoms of a contagious illness, you still don’t want a violently ill nanny caring for your children. When trips to the restroom are urgent and can’t be put off, your children may be left unattended for just long enough to get themselves into trouble. If her symptoms are the result of a communicable illness, the last thing you want is for everyone in the household to battle with a nasty stomach bug. Gastrointestinal symptoms are a sure sign that your nanny should take the day off to care for herself, even if it leaves you in a temporary bind. Some cold medications make people drowsy, while treatments for other illnesses can come with a wide array of side effects that could ostensibly affect your nanny’s judgment. If you know that she’ll be treating an illness with medications that can cause dizziness, sleepiness or any changes in mood or behavior, you may want to have a conversation with her regarding the duration of her treatment and what alternatives are available to you until she’s back to her old self again. Even after the most devastating cold and flu symptoms have passed, a lingering exhaustion and fatigue can make it difficult for your nanny to focus on her job properly. A childcare provider that’s devoting all of her energy to just staying awake may not be able to chase a busy toddler around, could be more easily distracted and suffer from an overall lowered job performance than she would if she were well-rested and healthy. If you know that your nanny is completely drained from an illness or that she’s going to have trouble maintaining order in your household while you’re away, it’s wise to carefully think about any other options you have available until she recovers. For the most part, a nanny with a chronic illness will have learned how to manage it so that her daily life is only marginally affected. Should her condition worsen, however, she’ll be forced to completely readjust her self-care routine and may not be able to devote as much energy and attention to your children as she normally does. Until another plateau has been reached and self-care is brought back under control, you should discuss alternate childcare options and ideas with your nanny. Finding the perfect nanny is no mean feat, which is why nanny poaching is a surprisingly common problem amongst professional families. To “poach” a nanny is to make a job offer to a nanny despite being fully aware that she’s employed by another family, and it takes place more often than some parents realize. Short of keeping your nanny hidden from the view of your friends and neighbors, there’s not much you can do to prevent envious parents from making a move on your nanny. What you can do, however, is make it difficult for them to succeed in their aims. Countering a would-be poacher’s offer might keep your nanny on the payroll in your household, but only if she lets you know that she’s been approached in the first place. By paying your nanny competitively before those offers start rolling in and treating her with the respect that should be afforded to the woman who cares for your children, you’re building a foundation of trust along with a working relationship that will naturally discourage her from entertaining offers passed along by envious parents. There’s more to a compensation package than just a salary, and the fringe benefits may be the very things that makes your nanny completely disinterested in accepting another offer. Whether it’s a holiday bonus, plenty of paid sick days, paid vacation time or use of certain amenities, the perks you offer your nanny are things that she might not be able to get from other employers. When push comes to proverbial shove, she’ll consider all the above-and-beyond compensation you offer and it will weigh heavily against the promises of a poacher. Employing a full-time nanny isn’t cheap, but it’s far more expensive to continually brave the hiring process because your great childcare providers keep getting scooped up by other families in the neighborhood. One way to truly set yourself apart from other families on the block is to offer health insurance to your nanny. Even paying a portion of your nanny’s health insurance premium can make a very real difference in her life, and in her job satisfaction. Few things are as terrifying as the prospect of a serious injury or illness to someone who can’t afford healthcare coverage, and the sense of security that comes with employer-sponsored health insurance may be enough to guard your top-notch nanny from even the most persistent poachers. Regardless of how well you pay or what perks you offer, a burned-out nanny that’s been the victim of job creep for too long will be more receptive to the promises of a nanny-poaching parent. It’s not easy to pay your nanny top dollar for services exclusively related to childcare, but it is the industry standard. It may seem harmless to add a few more tasks to Nanny’s to-do list here and there, but the cumulative effect of all those added responsibilities can be enough to burn her out completely. Before you ask your nanny to do additional chores or favors, think about any increases in responsibility she’s experienced and look for any signs of impending burn-out. Splitting the cost of a private, in-home childcare provider can seem like the perfect solution. In most cases, nanny share arrangements work out well and all involved parties are satisfied. Sometimes, however, the most carefully-planned nanny shares blow up in one family’s face. Before you consent to a nanny share, think about how well you know the other family and how well you think they’ll respect the boundaries of the arrangement. If there’s any doubt in your mind regarding their ability to stay honest and resist the temptation to simply poach your nanny and foot the bill themselves, you may want to think twice before you sign on the dotted line. If your nanny is attached to your children, genuinely enjoys working for your family and feels that she is a valued employee, you may be fortunate enough to receive notice that she’s been approached by another family. If you’re dedicated to holding on to your nanny and there’s room within your budget, one surefire way of shutting a poacher’s offer down is to counter it. Of course, countering the offer will require you to have a close enough relationship with your nanny that she feels comfortable explaining the situation to you.